Rest assured, the traditional Nazzaro kids on the couch Valentine is coming, I just have to get it loaded up. But in the meantime... here's a teeny pic of me and Sophie, holding one of her Valentines. 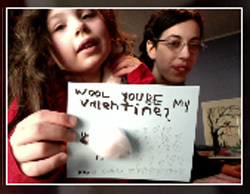 It says "Wool you be my Valentine?" and features a cotton-ball-made lambie and numerous hearts. Tomorrow we host my sister's bridal shower here - what a lovely way to celebrate my favorite holiday! Happy Valentine's Day!